Instant Pot Vegan BBQ Jackfruit Tacos! These pulled jackfruit are perfect for quick weeknight dinners. Made in the Instant Pot (with stovetop instructions) and topped with an avocado creme sauce. So delicious! 1. Open and drain the cans of jackfruit through a colander. Then cut off the hard tips of the jackfruit pieces and discard. 2. Add the jackfruit, onion, garlic, cumin, smoked paprika, salt, and pepper to your Instant Pot and mix until the jackfruit is completely covered with all the spices. 3. Add in the sriracha, tomato paste, barbecue sauce, lemon juice, vegetable stock, and stir until it is completely mixed together. 5. While the jackfruit is cooking, add all of the avocado cream ingredients to a food processor and process until smooth and creamy. You can add more or less water depending on your desired consistency. Set aside. 6. Once the jackfruit has cooked through, use two forks to tear apart the soft jackfruit ends to loosen them up and give the jackfruit more texture. 7. 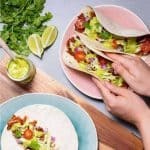 Assemble your tacos by layering jackfruit taco “meat” over a soft tortilla with lettuce, tomatoes, red onion, and other desired toppings. Serve topped with avocado cream.